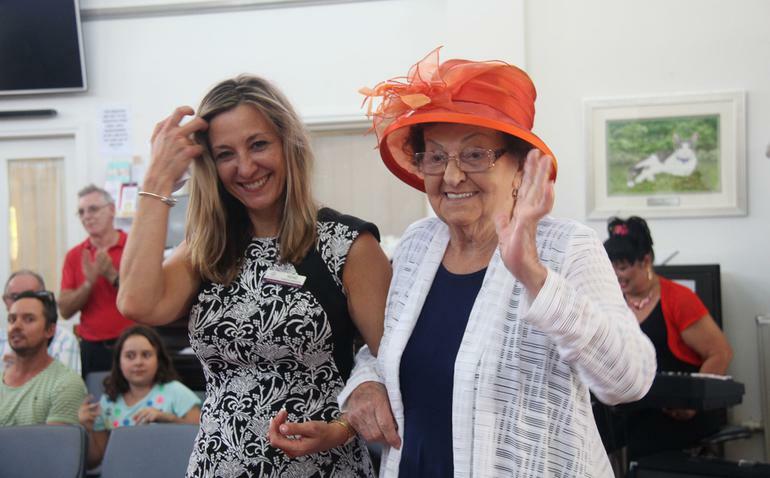 Exquisite hats, beautiful dresses and vintage accessories were just some of the items being paraded on the catwalk at Gold Coast hinterland St Andrews Lutheran Aged Care, Tallebdgera’s recent fashion show. A crowd of 120 people were wowed by the 13 local models who wore a range of outfits by fashion company Veducci and hats, bags and gloves by vintage label seller Boutique Déjà vu. Local Nutrimetics representative gave models and added touch of glamour and ensured they looked their best before stepping out onto the catwalk by providing her services and make-up free of charge. Although models had experienced a few pre-nerves in the lead up to the event, all were cast aside when the first model Lynette Frieberg stepped out on the catwalk. Ms Frieberg began with some fancy twirls and skirt-swishing, and the crowd responded by clapping and cheering. Creative Activities Coordinator Jess Spooner says this gave everyone a licence to have fun. “All of the residents who were lined up after Lynette took to it with the same energy and sense of fund. Once they were off, there was no stopping them,” she says. As well as the models, other residents participated in the event through their creative abilities; the parade was used as an opportunity to display calico carry bags decorated by residents’. Models carried the bags with them casually slung over their shoulders on the catwalk – and there was a wide variety of artwork on show including one bag featuring a football team. There was a practical side to the fashion show, with many of the clothing and accessories items being for sale. “Getting to the shop and navigating the whole changing room situation can be a daunting prospect for some of our aged care residents, so this event took away some of those restrictions by bringing outfits into their home and allowing them to shop in comfort,” says Ms Spooner.